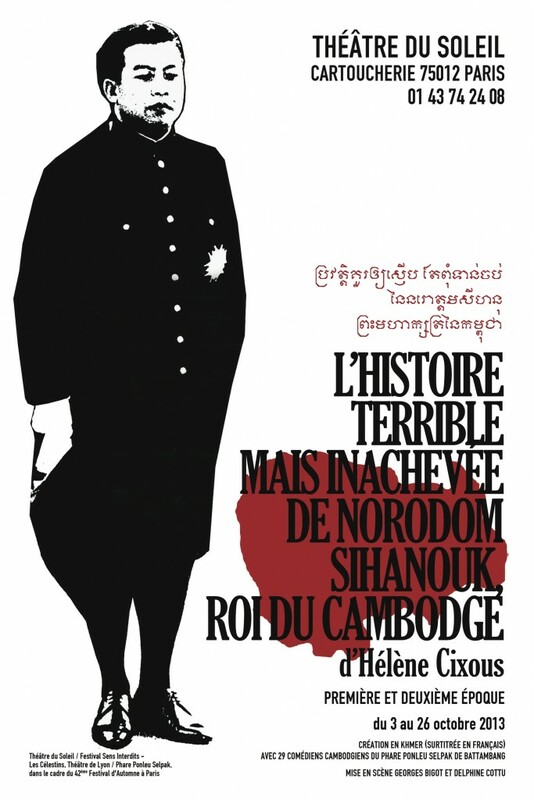 Poster of the First and Second Epoch of “Sihanouk”‘s khmer re-creation (2013). The re-creation of the Show in Khmer was made in two phases, corresponding to two differents periods treated in the play. 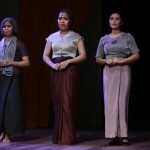 “It was not only a question of handing on the text, which was published after the original creation, but also one of bringing the young Cambodian actors and actresses from the Phare Ponleu Selpak Art School to work on the stage in the way it was conducted at that time, under the guidance of two actors from the Soleil: Georges Bigot, who created the original role of Sihanouk, and Delphine Cottu, from a different generation, who had not even seen the play in 1985. Their work, lengthy, slow, and fascinating, undoubtedly full of difficulties and challenging obstacles, was to convey the entire show to the young Cambodians, not just to impose a text and its initial staging. This method of working is faulty, and misrepresents the way that the Soleil works. Extract from Ariane Mnouchkine et le Théâtre du Soleil, éd. Les Solitaires Intempestifs, coll. Écrivains de plateau, vol. VI, septembre 2013. The First Epoch was created in Khmer on October 26th, 2011 at the Célestins – Theater of Lyon within the frame of the Festival Sens Interdits. Followed a national tour to Villefranche, Vénissieux, Valence, Chambéry, Grenoble, Epinal, Clermont-Ferrand then Paris, to the Cartoucherie from November 23rd till December 4th, 2011. Georges Bigot, San Marady et Sim Sophal ⓒMichèle Laurent, 2011. Two years later, having repeated in Cambodia and at the Cartoucherie (Paris), the troop performed the Second Epoch in Lisbon then in France : Limoges (Festival of Francophonies), Lyon (Festival Sens Interdits), Vénissieux, Valence and Toulouse. The first and Second Epoch have been performed in the Théâtre du Soleil, in the frame of the Festival d’Automne à Paris (3-26 october 2013). Program of the work in progress in Battambang 2010. Trailer made by the Festival Sens Interdits-Théâtre des Célestins, Lyon, 2013. Extracts from the play and interviews of the Phare’s actors. (french subtitles).